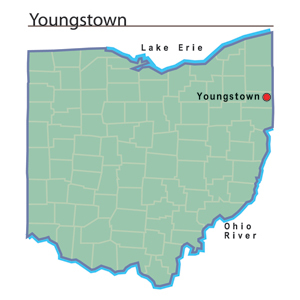 Youngstown was founded by John Young in 1797 and is within the original Western Reserve of Connecticut.Young had purchased an entire township from the Connecticut Land Company. He paid $16,085 for 15,560 acres of land. Within a short period of time, ten families settled in the village along the Mahoning River. Youngstown continued to grow and was officially incorporated in 1802. In the late 1800s, the first steel mills were constructed in Youngstown, signaling the new influence of that industry on the city's development. The new industry attracted many immigrants to the community, including Poles, Italians, and Hungarians. In the early twentieth century, the steel workers began to demand better wages and working conditions. There were a number of strikes in this era. By the 1920s, Youngstown was second only to Pittsburgh in terms of total steel production in the United States. At the same time, the industry faced some significant challenges. After the closing of the canal, the city no longer had access to water transportation. In addition, there was a shortage of water for use in the mills. In spite of these problems, the city continued to grow. The population in 1920 was 132,358 people, and Youngstown was ranked as the fiftieth largest city in the nation. The population reached its peak in 1930 at just over 170,000 residents.